Firefighters in Portage, Mich., were able to put out a blaze in the home of Lanchi Rohall two months ago, but, tragically, they were unable to save the lives of her six dogs. A compassionate dispatcher with Portage Public Safety who knew Rohall suggested to her supervisor, Torie Rose, that the department do something to help Rohall cope with her loss, MLive.com reports. With the grieving dog mom’s permission, employees began making donations toward getting Rohall a new dog to help ease her pain. Rohall is especially fond of Pomeranians, so the dispatcher began searching online for the perfect pup. 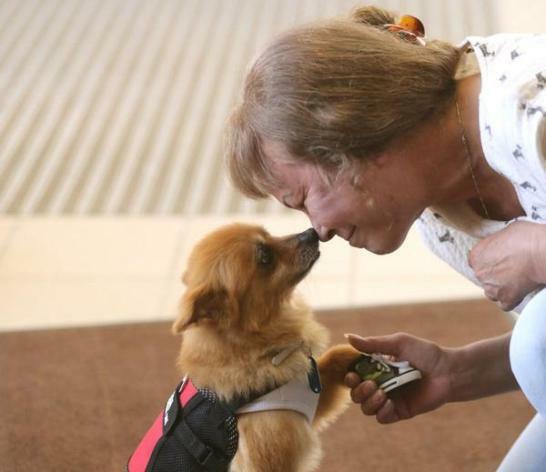 She eventually found Teddy, a rescued Pom who was available in Flint, Mich. The donations from Portage fire and police unions, as well as officers, covered Teddy’s $250 adoption fee. Rose and the dispatcher brought Teddy to Rohall, who is temporarily staying in a motel. Teddy, who was rescued from an abusive situation, was treated by a veterinarian for worms. He also has very sensitive paws, so Rohall got him some little shoes to protect them. Rohall and Teddy paid a visit yesterday to the Portage Police station. Rose said Teddy was like a different dog. Rohall said she is very thankful for how people have gone out of their way to help her since the fire. It was “wonderful, wonderful. God works in mysterious ways,” she told MLive.com. As for her new best friend Teddy, she said he’s adorable. “He looks just like a baby fox,” she told MLive.com.